Baby bottle decay occurs as a result of long-term contact between the teeth and liquids that contain sugars. Often, infants and toddlers are allowed to drink from bottles for prolonged periods of time – perhaps while lying down or watching television. The liquids pool around the teeth, which can lead to a build-up of plaque. Over time, this can erode the tooth enamel, resulting in early childhood caries. that breastfed infants who nurse for long periods of time can get nursing decay too? In fact, decay may also be found as a result of giving a child pacifiers dipped in a sugary substance such as syrup. The sugars feed bacteria on the surface of the teeth, causing irreversible damage. 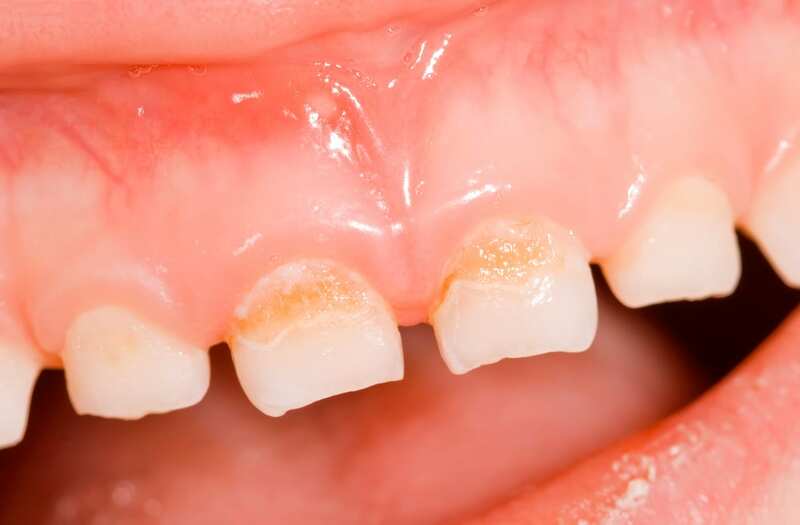 Baby bottle decay can affect any of the teeth, but it is most often found on the upper front teeth. A tooth may show visible signs of decay, such as the appearance of black or brown spots on the surface. Babies with infected teeth may also have swollen gums near the tooth. Pediatric dentists determine how to treat early childhood decay based on the extent of a child’s caries. When the decay is found in its earliest stages, it may be addressed with modified feeding habits and improved hygiene. Decay that is further progressed may require a crown or extraction. Fillings are not traditionally used to treat baby bottle decay in small children.